Cambridge Games Factory has impressed the hell out of me so far. While Glory to Rome was easily the best of their games I have played so far, North Pole and Zombie In My Pocket were both a heck of a lot of fun. Sure, all the games are about as pretty as a puddle of dog vomit, but they're good games. So when I sat down to play Barons, I knew I was going to be playing a fun game. 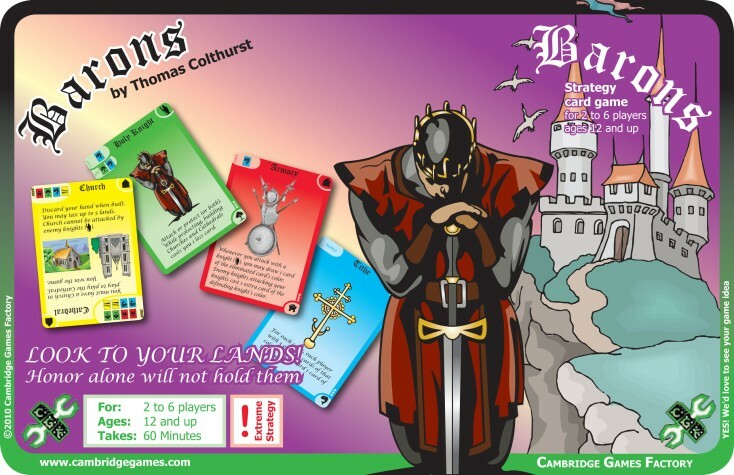 Barons is instantly identifiable as a Cambridge Games production because it's powerfully unattractive, and because it comes in a plastic clamshell package that may have previously been used to sell frozen fish. But I've learned by now that when it comes to this particular company, you can't judge their books by the cover. Unless that game is Barons. 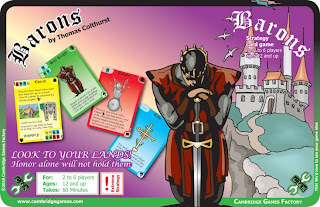 Then you can judge away, because Barons is a surprisingly disappointing game. It seems like it should be a smart, enjoyable game, but then you play it and realize that despite having the framework in place to be a fun game, it's actually kind of a dud. The art actually goes with the game in this case, because neither is very good. The goal in Barons is to build a cathedral in your lands. You do this by laying down cards from the four separate decks, either as land or for the buildings on the front. You pay for the buildings by discarding cards from your hand, which you get from collecting cards for the land. The buildings have special powers that can make your ultimate power grab more successful, so you develop a plan of carefully balancing the development of new land with the need for income-generating real estate. Or you would, except that every time I've played, the player who won didn't play any buildings at all. You can scheme and plot and manage this great strategy and wind up losing to the guy who just put down land every turn until he could go, 'Hey! Look at that! I win!' Then you throw your cards into the air and wonder what possessed you to bother in the first place. The reason I kept playing after the first few games was because I felt like there had to be something there. The beginning of the game really looks like it should be smart. 'Ooh, if I build this building, I can trade cards with other people! ', you'll say, until you stop to wonder why in the world you would do that. 'Hey, this one lets me draw an extra card!' Know what else lets you draw an extra card? Playing the building as land. And that's free. Basically, the oversight is that there's a lot of cool stuff to do, with knights who will go over to your neighbor's house and urinate on his living room furniture, or buildings that create cool combinations of effects, or clever ways to place your land. And then you do all this cool stuff, and it doesn't add up to anything. You have a barony that is protected against foreign incursion, with prosperous buildings and lovely city gates, and you lose the game to the guy who just put his cards face-down until he won. I'm still a little puzzled by Barons. I have seen a couple people say that the game was di-no-mite (I may be paraphrasing). And yet I can't see any reason that I would want to play it again, because there's just nothing in the box that calls to me. If it looked really great, I could understand wanting to play just to see the cool display. If it played great, I could overlook the ridiculous art and eye-gouging design. But instead it's an oddly boring game with art that looks like they gave it to the church secretary so she could apply the decorations with her Windows 95 Art Explosion CD, and I wind up incredibly disappointed in the whole thing and wanting to go back and play Glory to Rome again. In fact, I think that will be my plan going forward. I will not play Barons again, and I will use the box to store frozen fish. Furthermore, I will pretend it never existed, because I want to preserve Cambridge Games Factory in my mind as the creators of fun games that are very hard on the eyes. And one day when I have an unlimited amount of free time, I will volunteer to decorate all their games so that the church secretary can go back to making hideous Sunday bulletins. Because I am now pretending that Barons does not exist, I will not provide you with a link to a place where you could buy it. I can't link to a game that doesn't exist, can I? No. I cannot. Thinking that a land-only based strategy almost always wins in Barons is a fairly common mistake that new players make. Tiny Game Review - Galapa Go!